Ariel Winter has the perfect response for 'sorry' body shamers | HELLO! June 23, 2016 - 14:55 BST hellomagazine.com "I looked HOT in that dress"
Ariel Winter isn't going to let comments from critics get her down. Days after receiving criticism for wearing a bodycon cut-out dress to her graduation party, the Modern Family actress had the perfect response. Taking to Twitter on Wednesday evening, Ariel refused to apologise for her choice of outfit and instead encouraged her followers to "embrace" their bodies. "Dear sorry body-shamers, I looked HOT in that dress. And if you hate it, don't buy it. 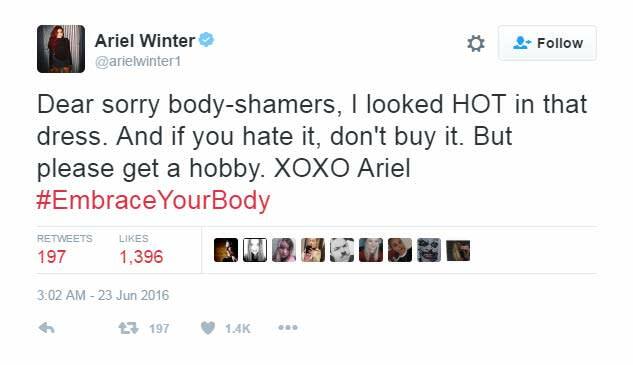 But please get a hobby XOXO Ariel #EmbraceYourBody," she tweeted. Then, sharing a photo of herself in skinny jeans and a crop top, she added: "Embrace all that you are. Don't let those outside voices become your inner voice #mychoice #loveyourcurves." She concluded by telling fans: "Know your value. Remember who you are. Love yourself. You're perfect. #stoptheshaming." Ariel has become outspoken about body confidence and positivity in recent months, defending Kim Kardashian's choice to share revealing selfies on Instagram in March. The 18-year-old took to social media to share her thoughts on the controversial issue, much to the gratitude of Kim. "Do what makes you happy. Do what makes you feel strong. If it doesn't harm others, there's nothing wrong with it," she tweeted alongside a photo that read: "Modesty empowers some. Different things empower different women and it is not your place to tell her which one it is." She is not the only female celebrity to speak out about body shaming, with the likes of Amy Schumer, Zendaya and Ariana Grande all hitting back after receiving comments about their weight.